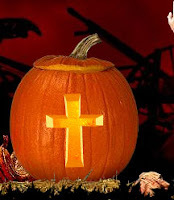 It has become somewhat of a tradition to repost here on my blog a piece I wrote a few years back regarding the relationship between Christians and Halloween. In fact, this will be the seventh year in a row for reposting this entry. Each year I have posted this, great conversation has been sparked and I hope that the same will be true this year. So, if you are a Christian who is debating whether or not Halloween is right for you and your family, please, check out this post because it may just help you out. Happy reading! It's not uncommon these days in North America to find some Christian somewhere who makes it their agenda to moderate and critique holidays. Currently, this can be illustrated by a simple perusing of Godtube.com, where a ridiculous debate is going on between those who call themselves believers. Some think it is okay to celebrate Halloween and others do not. Those who do not, as you might expect, label those who do as "un-Christian", "satanic", "worldly", "secular", etc. I can't help but laugh on the one hand and be heart-broken on the other. Clearly, too many people who act as though they are holier-than-thou, are over zealous and under informed. Their logic isn't even clear most of the time! So, how does one who calls themselves a Christian counter people who act too pious? Well, the place to begin is to rethink Halloween. In fact, it might not even be "re" thinking as much as "thinking in the first place". For example, it is helpful to know that Halloween doesn't have its origins in a secular holiday, no, it can be traced back to Christian roots; it was a Christian holiday celebrated by the Celts (e.g. All Saints' / Souls' Day or Hallow's Eve)--even though the Celts were considered by many to be barbaric. Even more than that, and perhaps, more importantly, it goes back to the end-of-summer Celtic celebration called Samhain, an agricultural festival. This was the time when people would soak up the "light" and prepare for the "dark" winter months. It was a time to celebrate agricultural fruits and goods before the harsh winter came and killed everything. Hmm, so, it was more about life than death in some ways, right? Yes! So, the over-zealous evangelists who argue that this is a satanic ritual, a celebration of death, etc., need to chill out a bit. I sense that many Christians have a problem with all of the ghoulish attire on the one hand and the supposed celebration of death on the other. Well, as for the ghoulish attire, we may recall that in earlier centuries, the Church actually used ghouls and whatnot to ward off evil spirits. Many modern church buildings still have gargoyles on them. As for the celebration of death, I think too many people have over-played this whole idea. I mean, those of us who have lost loved ones, there are certain times of year and certain things we do to commemorate their memory: We think of them, look at pictures, share stories, go to graveyards, etc. None of this is considered evil, satanic or un-Christian. On a similar note, some suggest that by celebrating death we are nullifying the resurrection. This is simply not true. First of all, Christians commemorate Christ's death (and resurrection) in communion; Christ Himself bade us to do this. Second of all, to remember the deceased is clearly not the same thing as worshipping them or celebrating death itself. It is this point that I feel many are missing. In missing this point, one Christian accuses another and everything just becomes ridiculous or, no joke intended, even "evil" and "nasty" and "ghoulish". In the 19th century, when Halloween migrated to North America from Europe, it was not a "devilish" holiday still. For example, the whole custom of "jack-o-lanterns", a pumpkin with a candle inside, was meant to resemble the soul of a lost one who might be waiting in purgatory. It was meant as a reminder to pray for that person or to simply, remember them. But it was also meant to be a symbol of celebration, of celebrating that person's life on earth. So, people would be merry and jolly and walk through the streets singing, sometimes even with bands. Often, this turned into a type of parade. Still, the custom existed that, if you have a jack-o-lantern on your porch, it was not just a memorabilia thing, it was a "message" too; a message to others that your loved one might need prayer or that you might need help appeasing God with gifts for that person's soul. So, people began leaving gifts, nickels, dimes, quarters, etc. next to the pumpkins. As time progressed, people, usually youths, began stealing these monies (which kind of became an expectation after a while) and run to the stores to buy treats and candies. Now, it's not too big of a step from this "thieving" to marauding and causing trouble--eventually, that's exactly what began to happen! Today, that's what much of Halloween has come to stand for and symbolize: pranks, danger, stealing, causing trouble, marauding, etc. And if there is anything to be against as a Christian, when it comes to Halloween, these types of things are it! In a world where holidays have become increasingly domesticated (e.g. Thanksgiving, Christmas, Easter, etc. ), it seems as though Halloween is the one night, the one holiday, where youths can go out, act crazy and try to subvert the holiday norm(s)! This too, should give us pause! Not only should it give us pause for negative reasons but maybe positive ones too: Maybe we should stop watering down and domesticating all of our meaningful holidays! So, in the end, there is no good reason for Christians to call each other names or to accuse persons of satanic or whatever. Just as well, there is no reason that Christian children should not be able to go out for candy, dress up and have fun. There is nothing evil about this. I would also say that our kids do not have to be "evangelistic" and dress up as Bible characters, etc. (though there is certainly nothing wrong with them being Bible characters). One last thought: Perhaps this holiday which is so often associated with darkness and evil, brings out the darkness and evil that reside in the hearts of many who call themselves believers. Yes, the name calling, the slandering, the hatred, etc. is all evil and it is all illogical. In my view, Halloween can be a profitable holiday, if for nothing else, to subvert those types of attitudes, a subversion done with merriment and tasty candy!